The next time you're in the mood for a snack, try one of these gourmet popcorn recipes. Popcorn can take on a wide range of flavors from spicy to sweet, so no matter what your taste preference, there's a popcorn recipe to match. Popcorn is one of the oldest snack foods around. Evidence of popcorn ears and popcorn poppers have been found dating back 5,000 years. So it's no wonder that this crunchy snack has been found in multiple countries and cultures, with various tastes, spices and seasonings available. Gourmet popcorn recipes, or popcorn sweetened or seasoned with a variety of tastes is a more recent phenomenon. Earlier versions included coating the popcorn in caramel, sugar or cheese with or without the addition of nuts, chocolate or dried fruit. Today, gourmet popcorn is growing in popularity around the world. Chefs and amateur cooks alike have tinkered with the basic popcorn flavorings of sweet, salty and buttery to produce taste combinations previously only found in a 5 star restaurant. Get creative with the spices and seasonings that you add to freshly popped corn for a real gourmet movie night. If you enjoy recipes with maple syrup, this sweet popcorn recipe is for you. 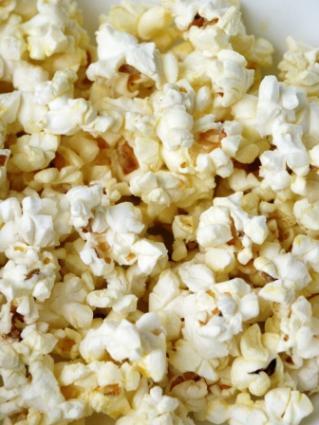 Pop the kernels using a hot-air popcorn popper and set aside. On the stove, combine the brown sugar, maple syrup and water and bring to a boil. Reduce the mixture to a syrup and cook until it reaches 235-degrees or the soft ball stage of candy. Pour the mixture over the popcorn and mix gently to cover. Just before the popcorn coating hardens, break the popcorn into pieces and dust with the cinnamon. This recipe forms a big batch of spicy popcorn, perfect for movie night with friends. Pop the kernels in a hot-air popcorn popper and set aside. In a skillet, melt the butter and add the curry, cumin, ginger and cardamom. Sauté the spices until fragrant, add the sugar and cayenne pepper, remove from heat. Drizzle the spicy butter over the popcorn and mix well to coat. This is the perfect recipe to try out your own pumpkin pie spice on. On the stove, bring the sugar, corn syrup and butter to a boil, and boil for 2 minutes. Stir in vanilla, pumpkin pie spice and salt and remove from heat. Spread the popcorn out on a baking sheet, when cool; break the popcorn into small pieces. This recipe has a very subtle flavoring with hints of oregano and garlic, topped with parmesan cheese. Melt the butter on the stove and stir in the seasonings. Pour the seasoned butter over the popcorn and toss with parmesan cheese to coat. Try one of these gourmet popcorn recipes the next time you're in the mood for a sweet or spicy snack and continue popcorn's rich history and taste.